Is Technology’s Relationship With Advertising a Match Made in Heaven? What does the future of advertising look like to you? To me, it looks like this: I’m standing in the middle of my living room, talking on the phone to one of my best friends. I’m in the market for a new car and tell her the make and model I’m interested in. As I sit down and turn on the T.V., I see an ad for the exact car I had mentioned. The same make, model, and color. This isn’t coincidence. I believe in the near future, with the help of data collected from voice recognition software similar to the versions used in Microsoft’s Cortana and Apple’s SIRI, keywords may be pulled from phone conversations in order to make ads more time sensitive and relatable. An opt-in feature would undoubtedly need to be established, but with the help of this technology keywords could be computed and data sent directly to broadcast networks. From there, media could be placed any time of day, ensuring you see the ad you need to see at the time you need to see it. The idea of taking information from my phone and creating an instant advertisement on my T.V. hasn’t come to fruition quite yet, and there are a lot of kinks to work out, but I think it’s something we can expect to see sooner rather than later. For those of you who say that this type of technology already exists, you’d be somewhat correct. Some companies have already tapped into the idea of mixing technology with advertising, but on a slightly smaller scale. Starbucks, for example, has an app available that can send push notifications to your phone. These notifications let users know when they are in the vicinity of a Starbucks store and in turn reminds users where their favorite drinks are located! This is useful, but how will this type of technology evolve to further benefit the consumer? Perhaps through the integration of Adtile’s interactive ads: They take advantage of a Smartphone’s GPS, gyroscope, motion coprocessor, accelerometer and compass to deliver a unique user experience. By using Adtile’s services, companies can send you notifications when you are near one of their stores, but that’s not all—the ad could prompt you to get involved by interacting with it to receive a promotion. 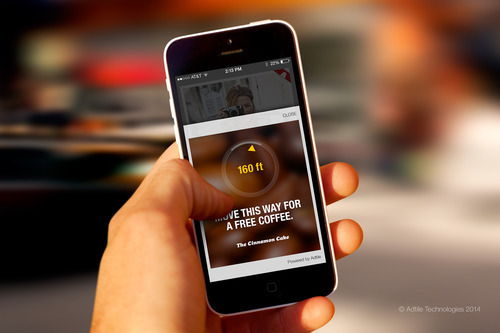 For example, an ad will prompt you to walk ten feet in order to reach your favorite coffee shop. Then, you might be asked to shake your phone to simulate mixing your favorite drink in order to receive a 10% off coupon that day. Each action you perform leads you to the next question, and closer to your reward. Another example of this type of “treasure hunting” can be seen in the video below. I think this is a great example of how technology and advertising industries can collaborate to create a truly unique user experience. This type of service utilizes various mediums to deliver utility and functionality, which in turn makes ads fun! Call me biased, but we Funksters like things like that. Technology is a growing part of the future, and has already changed the way consumers respond to advertising in a way we’ve never seen before. We can thank the dot-com revolutionaries for that. Maybe we’ll send them an e-card. I can’t help but wonder where technology will take the ad industry in the years to come. One thing I do know is that the future of advertising depends upon innovation and, now more than ever, depends upon technology to offer consumers the services and products they need and desire. Mix technology with advertising and throw in a little more fun? Now that’s a match made in heaven!